Three postulants admitted to the novitiate at St. Bernard's Abbey (Cullman, Alabama). If you know any prayers, send 'em up for these guys. St. Bernard's has received 16 vocations since 2001 - and now another three, assuming all three persevere. Their actual names are Cassian, Simeon, and Paul. Left to my own devices, I would have named them Brothers Massimo, Medio, and Minimo. From Saint Anselm Benedictine Abbey in New Hampshire - a postulant entered the monastery on the feast of the Trasitius of St. Benedict. They have two monks in temporary vows, one novice, and two postulants who entered in August. With this addition, they have six men in formation. Sr.Mary Gabriella P.C.P.A. professed her solemn vows on March 19 at Our Lady of the Angels Monastery in Hanceville,Alabama ! Assumption Abbey added 3 new photos. Last week on the Feast of St. Benedict, Novice Ian made his first vows and was also given the monastic name of Maximilian! So congratulations to Br. Maximilian - may his monastic journey be filled with the joy of our Lord! This is a pretty large abbey - about 50 monks. MOstly they farm their land, but they also sponsor retreats and staff parishes. They also have a daughter house in Bogota, Colombia. From St. Joseph Abbey (Benedictine monks) in Louisiana. These are what I call The Monks of Fire and Flood - they've been hit pretty hard by a couple of recent devastations. But they're also getting a steady influx of vocations - I think they've got six men in formation now. This entrance into the novitiate must've happened on March 28th or so. They also run the largest seminary in the US. Sr. Mary Daniela, O.P. made her first profession this past Saturday at Mt. Thabor Monastery in Ortonville, MI. Many pictures of the celebration on the community's Facebook page. Sr. Mary Daniela looks so very happy as she celebrates her first profession. Thank you for sharing. From Mary, Mother of the Church Benedictine abbey in Virginia. This is a very small community, with two monks in temporary vows. They now also have a novice. Meet our new addition to the Abbey family: Br. Richard. We had the clothing ceremony today [04-11-18] and this marks the beginning of Br. 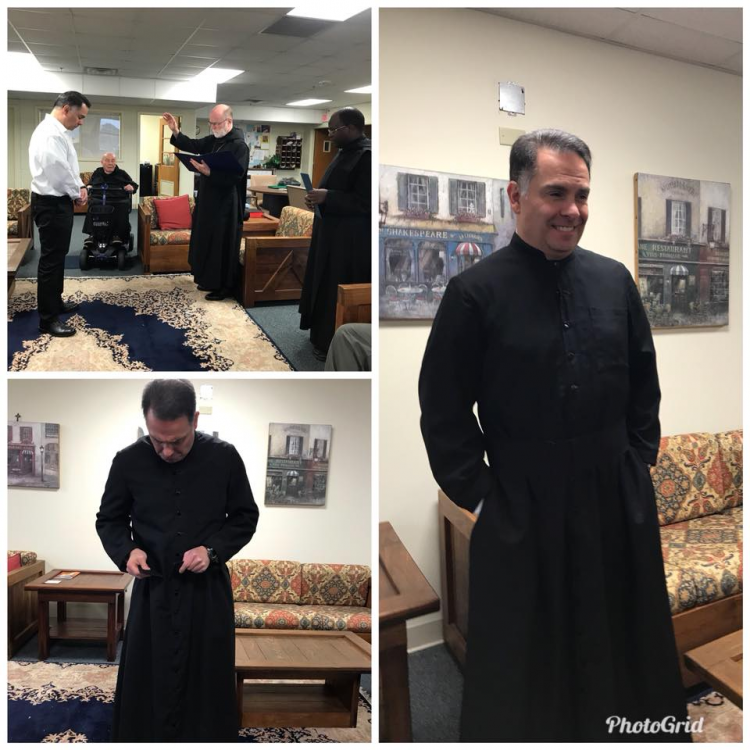 Richard’s journey to becoming a professed monk. Postulant Hilda for the Franciscan Sisters of Christian Charity. This evening Abbot Lawrence and the community welcomed Seburne James as he begins his monastic journey with us as a postulant. Seburne will now live full time with us and participate in the daily life of the community for a period of time before he is accepted as a novice and clothed in the habit.